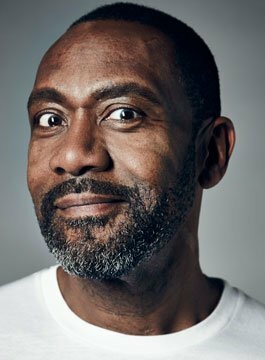 Sir Lenny Henry was born in Dudley, West Midlands, the son of parents who migrated to Britain from Jamaica in the 1950s. He studied at Bluecoat Secondary Modern School, WR Tewson School, and Preston College, and has since obtained a degree in English literature from the Open University. Lenny Henry shot to fame as a stand-up comedian in 1975 when he won the New Faces TV talent show aged 16. The following year he appeared in LWT’s sitcom The Fosters alongside Norman Beaton. His formative years were in working men’s clubs where his unique act – a young black man impersonating white characters such as Frank Spencer (whom he impersonated on New Faces) – gave him an edge in what were racially divisive times. He also toured for five years as a comic performer with The Black and White Minstrel Show, the only black performer in a troupe where the men all appeared in blackface. In 1978 he started co-hosting the children’s TV programme Tiswas, and subsequently performed and wrote for the show Three of a Kind, with comedians Tracey Ullman and David Copperfield. Three of a Kind introduced Lenny Henry to a larger TV audience and was followed by two series of the hugely successful Lenny Henry Show. He introduced characters who both mocked and celebrated black British culture, such as Theophilus P. Wildebeeste and Brixton pirate radio DJ Delbert Wilkins. In the early 1990s, Lenny Henry was lured to Hollywood to star in the film True Identity, in which his character spent most of the film pretending to be a white person (using make-up, prostheses, and a wig) in order to avoid the mob. In 1991, he starred in a BBC drama along side Robbie Coltrane called Alive and Kicking, and from 1993 to 1996 played the role of Gareth Blackstock, the arrogant, tyrannical and obsessed chef in the BBC television series Chef! In 1999 Lenny starred as head teacher Ian George in the BBC drama Hope and Glory – a series based on a comprehensive school struggling with financial, staffing and disciplinary problems, and faced with closure. In 2000, Lenny’s new comedy sketch show Lenny Henry in Pieces was launched; this was followed in 2004 with another series of The Lenny Henry Show. In 2003, he was listed in The Observer as one of the 50 funniest acts in British comedy. Henry is also one of the celebrities most associated with the British Comic Relief charity organisation along with Griff Rhys Jones, and has hosted the show as well as presented filmed reports from overseas. Lenny was awarded a CBE in 1999 for Services to Charity, and received a Lifetime Achievement Award at the British Comedy Awards in 2003. Lenny Henry continues to tour his stand-up show throughout theatres across the country. Legendary Chat Show Host and Broadcaster.